What is a blood clot and when are they dangerous? What are the symptoms of pulmonary embolism (PE)? What are the risk factors for VTE blood clots? Why is timely diagnosis of DVT and PE important? Why are VTE, DVT and PE difficult to diagnose? How can family, caregivers and friends support people who have VTE? What medications are used for VTE blood clots? Old and new blood thinners: How do they work? Which type of blood thinner is best for me? Can blood thinners cause bleeding? Are they safe? How often should I see my doctor when I’m on blood thinners? Is warfarin safe for me to take? Will I need surgery to remove a blood clot? What’s the risk of getting another dangerous blood clot? What factors increase my risk of another serious blood clot? Can compression stockings prevent all blood clots? What exercises can I adopt to lessen my risk of blood clots? I have had one episode of VTE, how can I prevent it from happening again? Will I have to worry about VTE blood clots all my life? Could You Have a Dangerous Blood Clot? 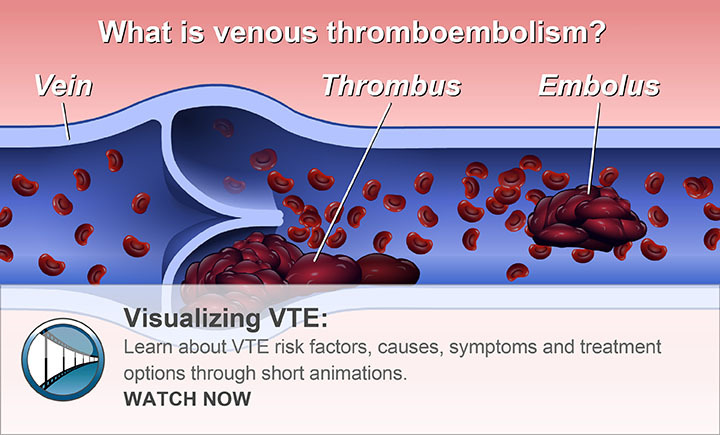 If you or someone you know has questions about dangerous VTE blood blots, our experts can help answer questions and help you learn more about VTE through a series of helpful animations and short videos. What is VTE? When a blood clot forms in the veins of the body it’s called VTE, or venous thromboembolism. VTE is a term that includes deep vein thrombosis (DVT) and pulmonary embolism (PE). A clot which forms in a deep vein in the body is called a DVT. A clot that breaks off and travels to the lungs is called PE. VTE blood clots can happen to anyone and can cause life-long health problems and can be life-threatening. Don’t let a blood clot happen to you. Talk to your doctor about ways to prevent VTE. 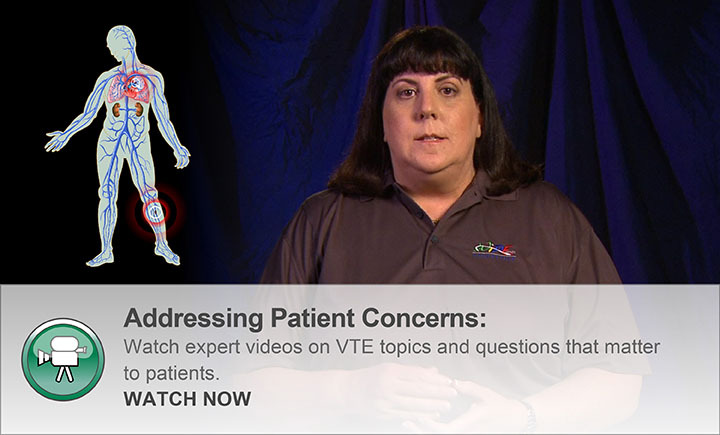 If you think you may have VTE, see a nurse or doctor right away so you can get proper care. It could save your life. 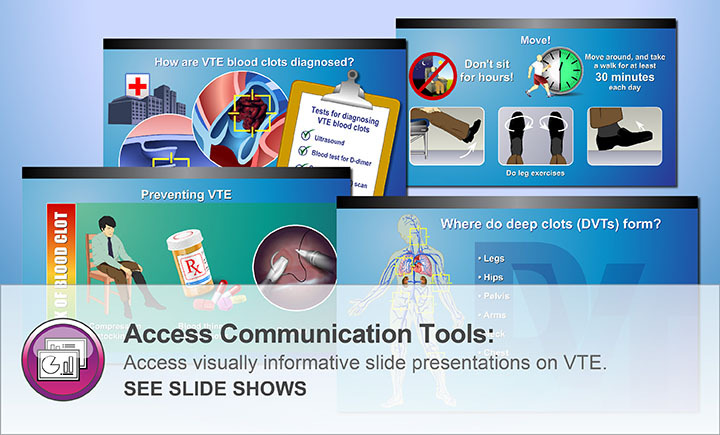 This evidence-based resource was developed by expert physicians, to help you understand VTE and its symptoms, risk factors, diagnosis, prevention and treatment to help you make important life choices. We hope this site will be useful to you, but it is not a substitute for the medical advice of your doctor. How well do you know VTE? Jointly provided by Postgraduate Institute for Medicine, WipeDiseases Foundation and Prime Medic Inc. This activity is supported by an independent educational grant from Daiichi Sankyo. This website is part of the Animated Patient™ series developed by Prime Medic Inc., to provide highly visual formats of learning for patients to improve their understanding, make informed decisions, and partner with their healthcare professionals for optimal outcomes.